Directions: This trail begins right off Highway 199 near the intersection with South Fork Road (Smith River). Park at the Myrtle Beach river access or just west at a big pullout across from the trail head. 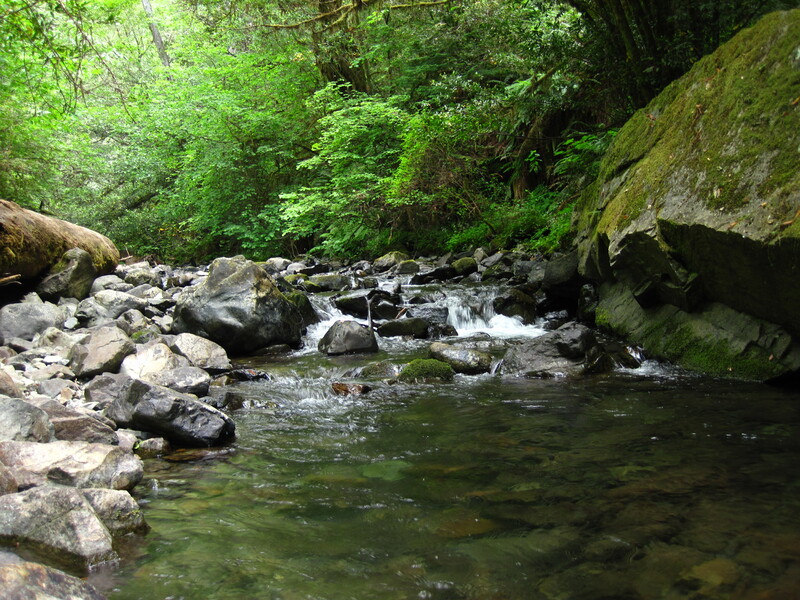 Myrtle Creek Trail is in the perfect location to offer a short diversion from driving along Hwy 199 or to enhance a visit to nearby beaches at the Middle and South Fork Smith River. For botanical enthusiasts it could be an all day destination. This unique one mile trail offers 15 interpretative signs which highlight mining, cultural and geologic history and a peak into why this area was designated as one of the four Botanical Areas within the Smith River watershed. The lower part of Myrtle Creek and its watershed are encompassed by the Myrtle Creek Botanical area. This area consists of 1,949 acres with elevations ranging from 600 to 1400 feet. Representing a “slice of life” between redwood and mixed evergreen forests, Myrtle Creek rests on a boundary between two major soil types which differ in their effects on the vegetation. 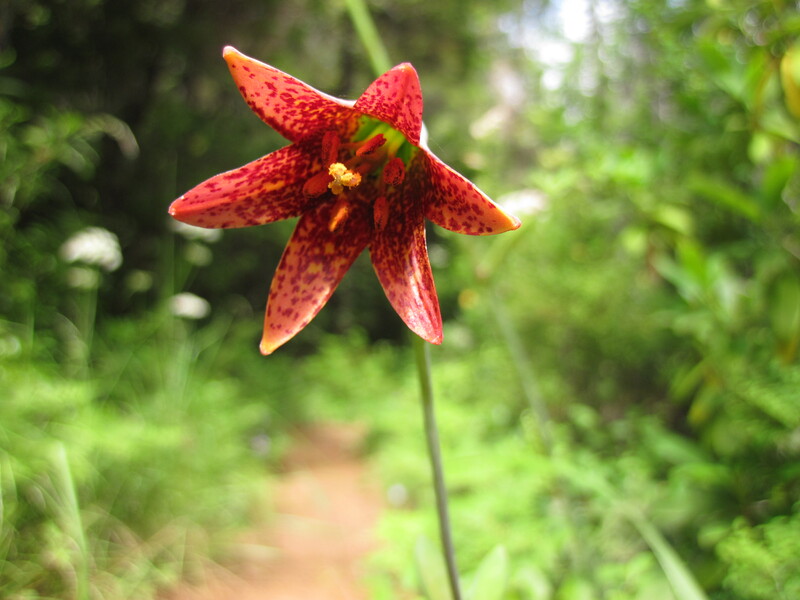 Species which can be found in both the coastal and interior environments occur here, for example, tanoak representing interior communities, and redwood representing coastal communities. The trail follows the course of a water diversion ditch that was used for a turn-of-the-twentieth-century hydraulic mining operation. It takes you out of the shady redwood forest into a very open and sparse knobcone pine forest. The sound of rippling water meets your ears as you meander along the path. Port-Orford cedar and red alder woodlands shade the waters of Myrtle Creek below. Seep areas, easily viewed from the trail, support the striking California pitcher plant and the delicate five-finger fern. Crescent City investors had good reason to expect a return on their money when they founded the Myrtle Creek Mining Company in 1894. After all, placer mining (panning for gold) during previous years had turned up some impressive nuggets in the drainage. The largest single nugget found in the creek was the size and shape of an ax bit and weighed in at a healthy forty-seven ounces. With the easy pickings gone, however, the new miners turned immediately to hydraulic mining, which allowed them to extract the tiny deposits left in the sand and soil. For a time the effort paid off, but by the early 1920s the gold had become too expensive to remove profitably, and the mine closed. Today only the ditch, a few pipes and trestle timbers, and the slowly healing scars remain visible along the trail. 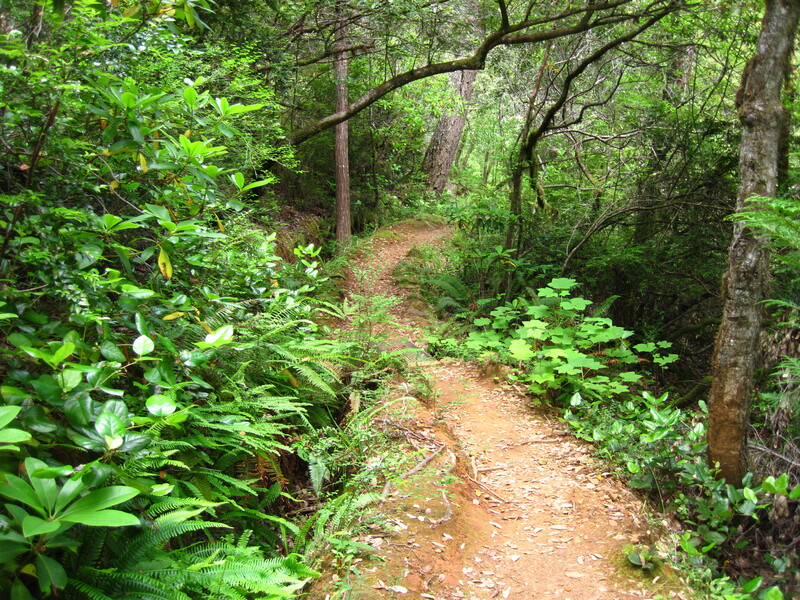 Myrtle Creek Trails packs a lot of punch for its one mile length. Along with its lush vegetation, wildflowers and loads of information, hikers are greeted at trail’s end with an up close look at Myrtle Creek. It’s the perfect stop for any time of day, or year.